This camera was purchased only for an event series lasting less than 6 months. Less than 50 hours of use. Looking to sell for full $1400. Two (2) additional long lasting batteries included. Credit card accepted via Square or Cash. No checks. 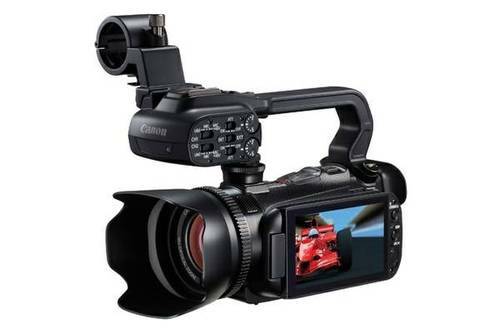 The XA10 Professional Camcorder allows users to record up to 24 hours of clear high definition video to a 64GB internal flash drive or to two SDXC-compatible memory slots. With Relay Recording, the camcorder automatically switches video recording from the internal drive to the SD memory cards when the memory becomes full. Video can be copied from the XA10’s internal drive to removable SD memory cards. That makes it easy to insert the card into your computer or HDTV’s card reader and view your recorded footage immediately. Shot entirely on 15 iPhones by 15 Cinematographers in 15 locations on 5 continents all in one day. 45 stories told using 100 iPhones, resulting in over 70+ hours of footage edited by 21 Editors entirely on Macintosh. 46 iPads were used by crew members as well as 86 Macs. See the full production story. FanAddict is a personal music journal app for fans of live and recorded music. It is the ONLY app that lets you create your own digital scrapbook, where you can also track and discover new artists, events and music. FanAddict is all about personal discovery and destination. Track concerts, buy tickets, follow artists' Twitter feeds, download songs, track and relive your memories and get exclusive promotions from your favorite bands and venues - all in one place!! GINA BOYCE OF GEGI DESIGNS, LAURA MCGREW OF TOMBOY DESIGN STUDIO, MAEGAN STRACY, KIRSTEN PALUDAN & JEREMY ROCKWELL OF KANVAS COMPANY, VOLER AERIAL ARTS, DJ SHEPPA, VINTAGE EDISON, LANDERS VISIONS, ONE8OAK, CLEAR10 VODKA, BIJIN SALON & SPA, KANSAS CITY FASHION WEEK, CHRISIAN MICHAEL, NATALIYA MEYER, KALYN VALLIERE, TARA KLOEPPEL, KENNY JOHNSON, SASHA BANKS, AMBER CHRISTMAN, PRICE LEATHERBARROW, DREW SJERVEN, COURTNEY SOLDAN-ELS, JESSICA TAYLOR, MEGAN SEITHEL, WILLA DOCK, RYAN WHITE, WINNY DUKU, JEFF EVRARD, & CARMAN STALKER. Dead City Girl COMING SOON!! !